Thoroughly shuffle an ordinary deck of cards. Then allow your friend to pick any card from the deck. She should look at it and not show it to you. This is her first “key” card. Tell her that you will deal the remaining 51 cards one-at-a-time, face up onto a pile. If she is holding a non-face card, she must silently count the cards as you lay them down. When she reaches the number on her key card, the upturned card becomes her new key card. If her key card is a face card, then instead of counting, she should silently spell the name of her card (e.g, J-A-C-K). When she reaches the end of the name, the upturned card becomes her new key card. She should repeat the process as you continue to deal the cards. 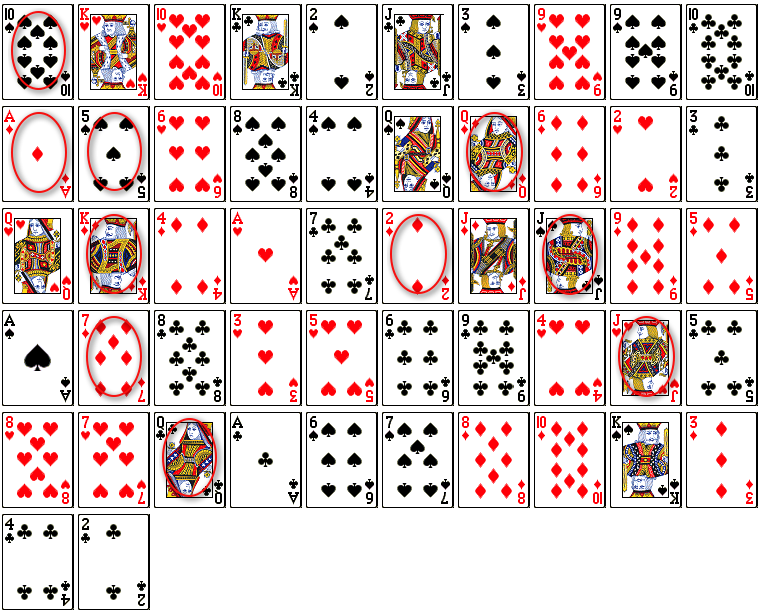 For example, suppose the shuffle left the cards in the following order (I used Random.org to produce this shuffle) and that your friend chose the top card as her first key card (the 10 of spades in this example). 1 (king), 2 (10), 3 (king), 4 (2), 5 (jack), 6 (3), 7 (9), 8 (9), 9 (10), 10 (ace). 1 (6), 2 (8), 3 (4), 4 (queen), 5 (queen), Q (6), U (2), E (3), E (queen), N (king), K (4), etc. When you turn up the queen of clubs you stop and tell her that this is one of her key cards. How does this trick work? How do you know when to stop? I’ll post the secret behind the card trick in a in a separate post. If you figure it out, please do not reveal it in the comments.